Compact and efficient process air/inert gas heater, capable of producing exit temperatures up to 1400°F (760°C). The serpentine coil element is supported along its entire length by a threaded ceramic rod, and is protected by a quartz tube sheath. 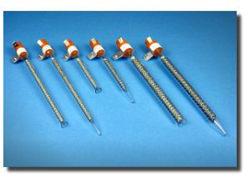 The Series heaters are available in either open-ended or nozzled styles. Wattage ranges from 600W to 4000W. If operated correctly, element life will be greater than 5000 hours.